Folks, we are delighted to announce the launch of our new Highstreet website. We recently created a new online shopping system, and realize it could cause some confusion for shoppers who created an account in the old system. Unfortunately we couldn't move the old orders and user accounts from the old system into the new one. The old system had no options left for the future. All orders from the old system are shipped and if you ordered tracking then your will get an email wih tracking information. Our brand‑new webshop is super fast, 100% SSL secure and automatically adapts when opened on a desktop computrer, phone or a tablet. If you can't login in your account, feel free to create an account in our new webshop. PLEASE READ BELOW BEFORE YOU CONTACT US! 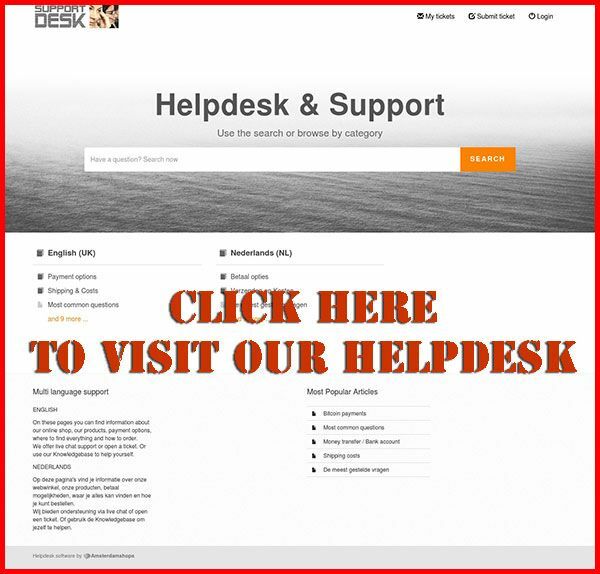 WE USE A NEW SUPPORT HELPDESK! Many customers find the answers to their questions in the short FAQ below. You may also take a look at our Frequently Asked Questions in our helpdesk. If you can't find an answer to your question here, we'll be more than happy to help you out via the live chat button. FOR FAST ANSWERS, PLEASE USE THE SEARCH BOX AT THE BOTTON OF THE PAGE! An email with tracking information will be send to you at the end of the day that your order left our warehouse. THis email comes from Postnl.nl and will provide you with the tracking code. Please first check our standard shipping times as well. We ship world wide. All our packages are discreet, with only your address and a generic return address on the outside of the package. I have paid my order, but the status in my account is still ‘waiting for payment’. Is something wrong? Depending on the payment method, processing may take some time. A bank transfer may take up more than 1 business day to be processed. Your package will be shipped within 1 day of receiving payment and you'll be notified by email. Should the order still not be processed within 48h, please don’t hesitate to get in touch with our Customer Support. If you haven’t paid for your order yet, you don't need to take further action. Unpaid orders will not be processed by us. If you have already made the payment, we can't cancel the order for you or arrange for a refund if the order has been shipped already. If you haven’t paid for your order yet, simply place a new order containing the products you want to receive. There's no need to cancel your original order! I’d like to change my payment method. Simply place a new order and select your payment method of choice. There's no need to cancel your original order. We accept Bitcoins, Bank transfer and Cash. No credit cards!